Not all chia seed bars are made equal. We realized this in a recent taste test where we faced Health Warrior Chia Bars with Chi Innovations Chi Bars to see which one came out on top. So what’s the big deal about chia seeds? For starters, one 16 ounce bag contains the same amount of Omega-3 fatty acids as 10 pounds of salmon. Yes, 10! As Health Warrior points out, Omega-3s are essential for brain function and cell and tissue growth. One pound of chia seeds also contains the same amount of protein as three pounds of tofu, and the same amount of fiber as four pounds of oatmeal. That’s a lot of nutrients in a tiny package. Our competitors both tout the superfood chia seed as their star ingredient, but beyond that the two brands are worlds apart. Let’s dig into what makes them unique. Health Warrior’s Chia Bars are gluten, dairy and soy free and vegan. Each 0.88 ounce bar contains an average of 100 calories, 6 g fat, 2 g saturated fat, 13 g carbohydrates, 4 g fiber, 4 g protein and just 5 g sugar. Chia bars come in three flavors: Coconut, Chocolate Peanut Butter and Acai Berry. 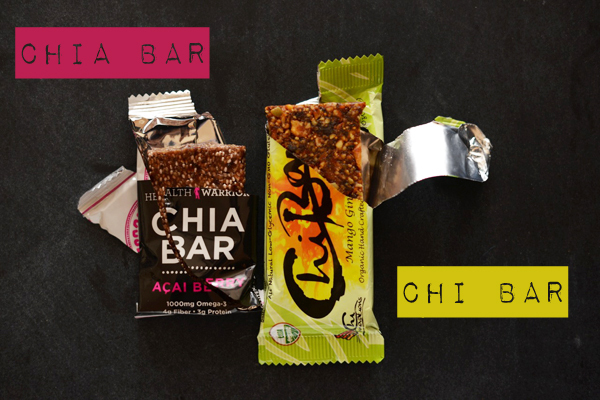 Chi Bars by Chi Innovations are all natural, low-glycemic, non-GMO, vegan and gluten free. Each 1.7 ounce bar contains an average of 200-220 calories, 12 g fat, 3 g saturated fat, 23 g carbohydrates, 16 g sugar, 4 g fiber and 6 g protein. Chi bars currently come in four flavors: Papaya Pineapple, Mango Ginger, Cacoa Cherry and Berry Berry. We judged based on five categories. Here are the winners in each. Taste: Health Warrior Chia Bars – While I liked both bars’ taste, I appreciated Chia Bar’s flavor variety and especially loved the acai berry and chocolate peanut butter. Texture: Chi Innovations Chi Bars – I much preferred the texture of Chi bars as they were dense, slightly nutty and not too crunchy. Chia Bars were far too crunchy for my liking with too many chia seeds per bite. Cost: Chi Innovations Chi Bars. Although a 15 pack of Health Warrior Chia Bars cost just $23.50, you actually only get 13 ounces worth of product, putting the actual cost at around $1.80 per ounce. Chi Innovations bars come in 12 packs, which cost $33, but you get 20 ounces worth of product making their actual cost $1.65 per ounce. 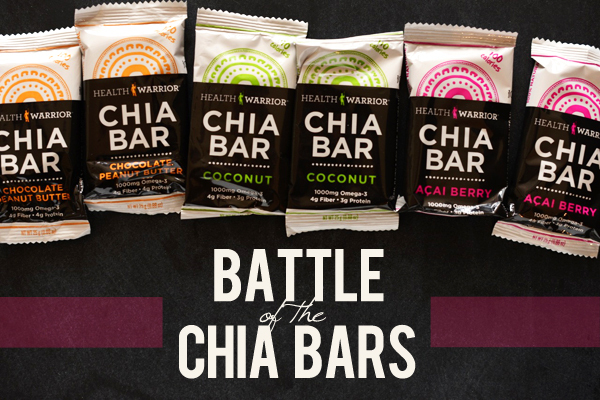 Packaging/Appearance: Health Warrior Chia Bars. This is strictly aesthetic, but I much preferred the sleek, colorful packaging of the Chia Bar. Serving Size/Nutrition: Health Warrior Chia Bars. Nutritionally speaking, I loved that the Chia Bars are pre-portioned at just 100 calories and contain less than 5 grams of sugar. This makes them the perfect snack or post-workout recovery treat. Chi Innovations Chi Bars are no doubt healthy, but are more of a calorie indulgence at more than 200 calories per bar. Overall Winner: It was a close race but Health Warrior Chia Bars took the gold! You didn’t think we’d forgo making our own bars did you? We whipped up some chia bars of our own in an attempt to combine our favorite flavors, textures and taste aspects of the two chia bars we sampled. 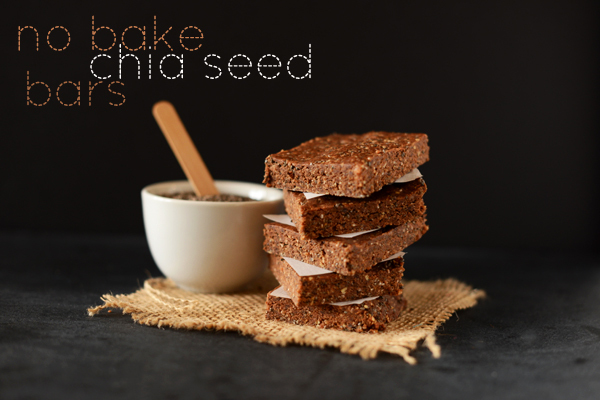 The result was a 5-ingredient chia bar that tastes just like a no bake cookie. Method | Blitz dates in the food processor until only small bits remain. Then add remaining ingredients. Mix until well combined and it forms a dough, adding more peanut butter if it appears too dry or crumbly. Press into a parchment lined loaf pan until uniformly flat. Freeze for 15 minutes to let set and then remove and cut into 8 square-shaped bars. Store in an airtight container to keep fresh for up to a week or two. Keep in the freezer for longterm storage. Estimated nutrition per bar: 193 calories, 8 g fat, 2.2 g saturated fat, 15 mg sodium, 29 g carbohydrates, 6 g fiber, 19 g sugar, 4 g protein. These taste just like a no bake cookie and require just 5 minutes! Plus, there’s no refined sugar and they keep for months in the freezer. 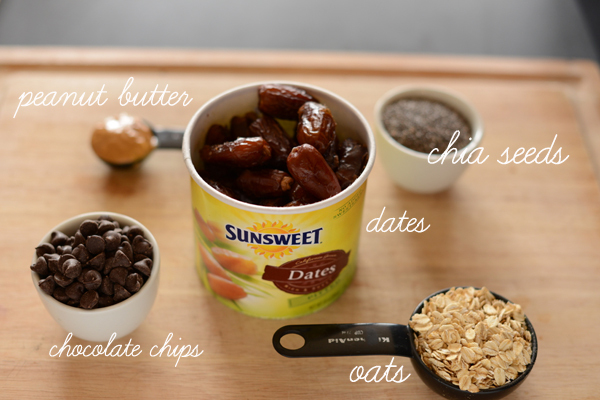 For a low maintenance, quick, healthy treat that’s great for on-the-go snacking, it doesn’t get much better than this. 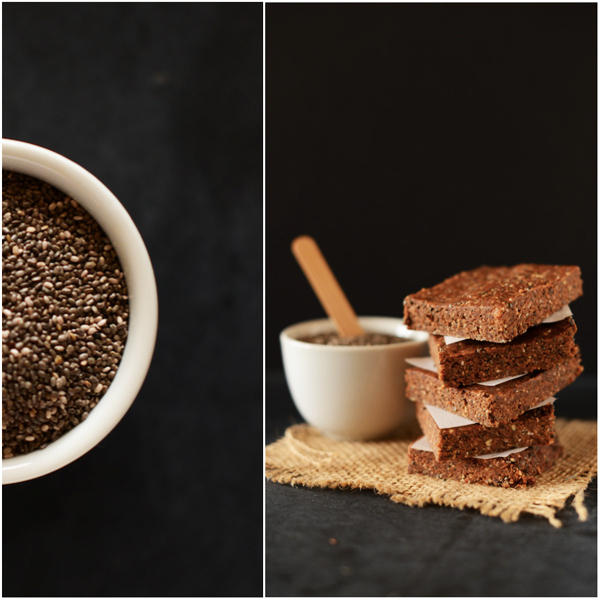 No matter how you decide to indulge, you’ll be wise to add more chia seeds to your diet. Pick your brand or make our recipe and get to snacking! I agree Health Warrior has the best chia bars! I would love to recreate the Coconut one they make, so simple yet so unique of a taste.